According to my father, the first word I spoke was horse. A strange choice as I don't come from a 'horsey' family, so either I had a grasp of the English language from a very early age, or my dad was telling tales and I burbled 'dada' just like all small people! I say this, but to be fair to my dad, my earliest memories are of horses. I was obsessed with them. One of my earliest memories was being in a hospital riding on an old fashioned wooden rocking horse. My brother was ill at the time, but that is the only thing I can remember, the wooden horse! Unsurprisingly the earliest toy I can remember was a rocking horse I called Bluebell (after the donkey in Ivor the Engine) I still have her, the rockers were removed for ease of storage, but Bluebell remains in the loft, my black and white piebald pony. She taught me all that I know about horses. 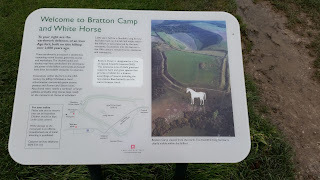 I wasn't allowed riding lessons as a child, lots of various reasons that I don't intend to go into, but my parents would pick up books about horses at car boot sales and I would learn how to apply exercise bandages, how to plait manes and tails, and how to mount a horse correctly. It came as something of a shock when I mounted a real horse for the first time. To be honest, the number of calamities I have had over the past twenty or so years have amazed, bemused, and thoroughly entertained many of my close friends. They look at me with disbelief, then remember who they are talking to, and then they exclaim that they don't know how it is that I'm not dead yet! I have no idea either, but if there's one way to go, instantaneously doing something you love can not be a bad way! So there's the background, I've always loved horses, and growing up I have seen the image of horses cut into hillsides and I've always wanted to go and see them. 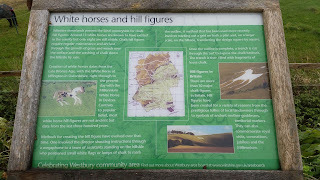 The area of Wiltshire has several of these horses, and the Westbury of Bratton White Horse is the oldest of them. 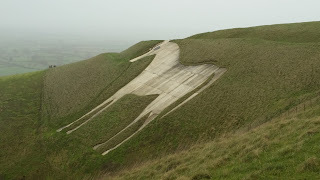 It is carved into a hillside just below the remains of an Iron Age hill fort. 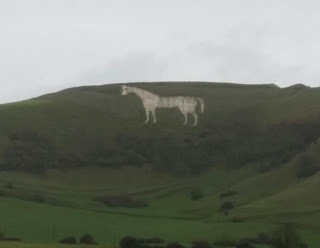 The horse stands at 180 feet tall and 170 feet wide, and was restored in 1778. 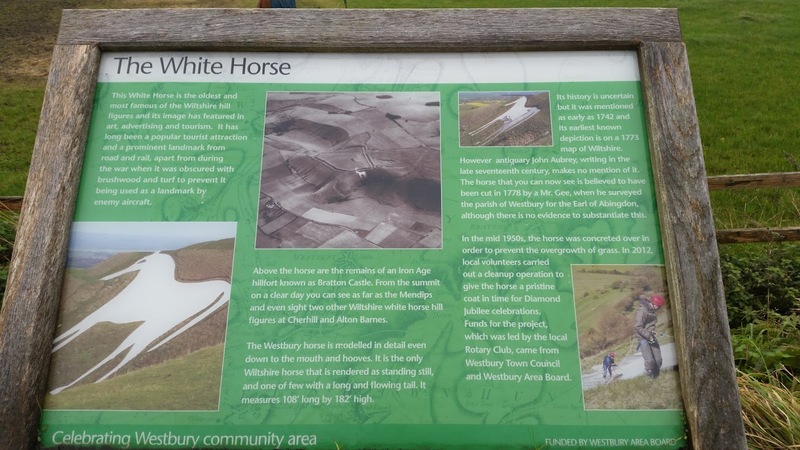 This restoration has caused arguments about the original Westbury Horse, as there is an engraving from the 1760s which shows a smaller horse which faces in the opposite direction. There is insufficient evidence however that there was anything carved into the hillside before 1742. 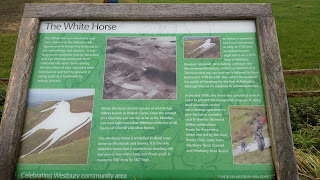 I therefore decided that a Sunday was the perfect day to go for a walk and to view this interesting part of history. Despite it being a little bit windy, I drove off to Westbury. Well they say that a Sunday walk can blow the cobwebs away, and by the time I reached my goal, there were no cobwebs left! The wind had picked up and by the time I reached the top of the hill, I was experiencing gusts of wind at over 50 mph hitting me, and the darkening skies were a stark warning that torrential rain was about to hit! Windswept and looking like a drowned rat, I plonked myself back in the car and headed off to find a pub, preferably one with a roaring fire! As I sat with my pint of well earned Guinness, I couldn't help but smile. 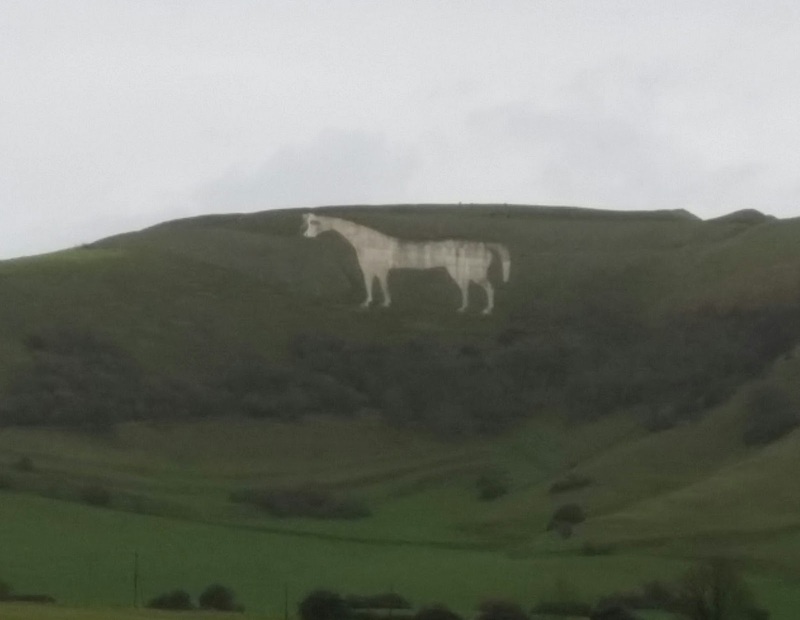 I can be very bloody minded and I was going to see that carving of the horse 'come hell or high water' as the expression goes...and for once, whilst standing in that howling wind and teeming rain, it really did seem to have come to that!